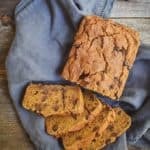 Moist & dense Chocolate Chip Pumpkin Bread that is easy to make, healthy, low-fat, vegan and absolutely delicious! Mix pumpkin, maple syrup and vanilla in large bowl. Add remaining ingredients, except for chocolate chips, to pumpkin mixture and stir together until everything is well combined. Pour mixture into a nonstick 9×5 standard loaf pan and bake for 40-50 minutes. If you don’t have a nonstick pan, you can line with parchment paper. If you do use a cooking spray, just slightly mist the pan. Loaf is done when knife tester comes out clean, except for a few chocolate chips. If you don’t have pumpkin pie spice use 1 tsp. cinnamon, 1 tsp. all spice, and 1/2 tsp. ginger.